Home › Israel Patent Office Rulings › Khan Shaharut – Descriptive or Distinctive? Khan Shaharut – Descriptive or Distinctive? Israel Trademark Application No. 231719 “Khan Shaharut” was filed by Negev & Galil Initiatives LTD. for food, drink and temporary accommodation related services in Class 43. The word Khan is Turkish for a caravanserai, an a roadside inn where travelers can rest and recover from the day’s journey. (It also was the name of an English Progressive Rock Band in the 1970s, a wrathful character in Star Trek, and a Marvel Comics character). Khan Shaharut is the name of a hostelry in Maale Shaharut, a town in the Arava part of the Negev that provides meals and sleeping accommodation. The trademark office rejected the application as lacking distinguishing characteristics (section 10(11) of the Trademark Ordinance 1972, but authorized the applicant to provide evidence that the name had acquired secondary meaning. In response to the request for evidence of secondary use, the Applicant filed an affidavit arguing that he had purchased the initiative in 2007 from Shaharut Desert Lodges LTD and 21st Century Camel Riders LTD., who had operated the Khan since the 1980s. The applicant was requested to provide additional information regarding publicity of the Khan, and as two years from filing had passed, the case was transferred to the Arbitrator (name not given). In a hearing in February 2012, the CEO of the Applicant indicated that the trademark Khan Shaharut had been in use since 1985, although the name of the company was Khan Shaharut – Camel Riding. Since acquiring the company, the name Khan Shaharut was in exclusive use. In another claim, the CEO argued that Khan Shaharut was situated in Maale Shaharut, (Shaharut Heights), which is not known as Shaharut, and so the word Shaharut could not fairly be considered a geographical application of origin. In a supplementary affidavit, the applicant provided further details regarding the services provided by the site, and that a holdiay village was being developed. In the Ruling, the Arbitrator rejected claims that the location was only known as Maale Shaharut, since on maps of the judicial region it was called Shaharut. He/she noted that no financial information was supplied that could help substantiate the claim, but nevertheless, provided more than 20 popular Israeli news related internet sites where the mark Khan Shaharut was used in advertisements. The mark was allowed to proceed to publication. Genghis Khan fought from horseback. 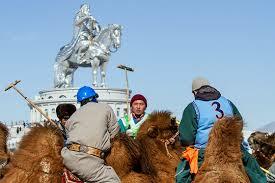 Mongolians do ride camels, but they ride the two humped bactrian camel variety, as the image of Mongolians playing camel polo under a statue to Genghis Kahn testifies. In the Negev, we have dromedaries. Whether Mongolian tourists would have a problem with the juxtaposition of Khan and one humped camels is a matter of conjecture. Since the camel riding part of the name is now no longer in use, perhaps we’ll never know. ‹ 5-Hour Energy Minimally Distinctive or Purely Descriptive? I suppose this is the place on route 90 we go by regularly on our way to and from Kibbutz Lotan. I don’t remember ever stopping there. You write “In the Ruling, the Arbitrator rejected claims that the location was only known as Maale Shaharut….” when you mean “known only”. Saying it’s “only known” implies “only named” or “only operated as” or anything else you can think of.